Divination tools have been around since the earliest stages of civilization as a way to interpret the will of the gods. Sometimes they are used to foretell the future and other times they are used to reinterpret the past. Those who use divination tools are often called shamans, seers, medicine men, sorcerers, witches, and priests. They spend time training in their practices to learn how to have more accurate visions. Learn more about the different kinds of divination they use below. Numerology is the art of studying numbers as a way to divine what the course of your life should be. Numerology can help you anticipate challenges you will face and forsee coming hardships. Numerology can also be used to predict things you will accomplish. To figure out your future using numerology, you start with your life path number. To calculate your life path number, add up the digits of your birthday including the month, day, and year. The final number corresponds to your personality type and a particular life path. Ouija boards are one kind of spirit board that has the alphabet, numbers, and the words “yes” and “no” on it. It can be used to do spiritual readings by placing your hand on a planchette. 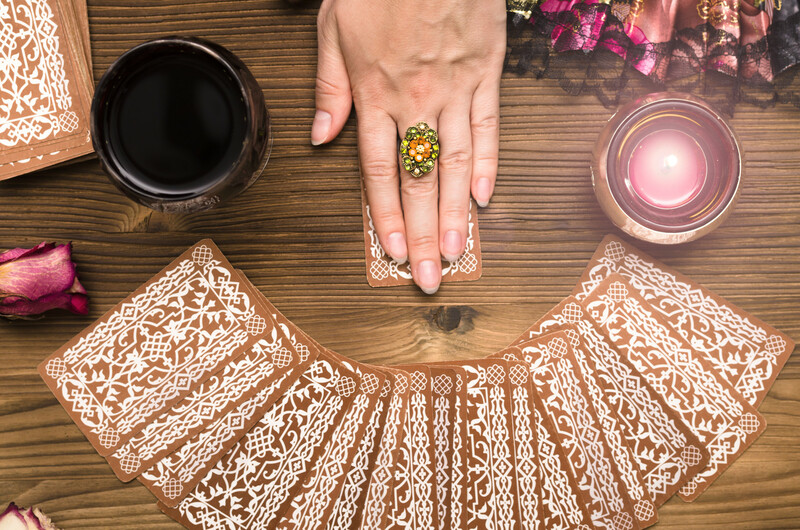 The planchette is guided by a spirit to give you complex answers to the questions you ask. Make sure you are careful when you are using an ouija board, if you contact an evil spirit, you could become possessed. Runes were once an ancient system of writing. But today the symbols are imprinted on stones, tiles, or wood as a way to get answers to questions. Usually, someone will make their own runes as a way to give them personal significance. They will then toss the runes or lay them out in order to interpret them. Tarot cards are one of the most interesting forms of divination because there is arcana that goes along with all 78 cards in the standard deck. Each card has a meaning that can be interpreted based on the order they appear in the deck. To do a tarot card reading, you call on the spirits to inspire your deck to bring you answers. Then, you lay out the cards which will appear in a particular order in order to tell you what the future will bring and how you should respond to situations that are headed your way. While tarot cards can’t give you any specific answers about the future, they can help you prepare your mind for coming challenges. Angel cards derive from oracle cards. They’re a way to ask angels for assistance in making decisions in life. They can tell you things like what to do in romantic situations, how to handle family matters, and how to respond to financial issues. There are many different decks of angel cards out there. They’re different from tarot cards in that they don’t rely as much on metaphysical concepts. Instead, they answer more direct questions. Reading tea leaves is a ritual practice that stems from the gypsies. In order to do it properly, you will need a specific teacup and saucer that is imprinted with various symbols. In order to do a tea leave reading, you will need to drink a cup of loose-leaf tea and then examine the pattern the grounds make in the bottom of the cup. The interpretation of tea leaves varies a lot from reader to reader. So it’s important that you seek out a practitioner who understands your questions well and knows a bit about where you are in life. Astrology is the reading of the placements of the planets and stars. There are twelve different zodiac symbols present in the sky based on the time of year that you are born. From your zodiac symbol, you can learn about someone’s personality traits and also read their horoscopes. Learn more about astrology. Automatic writing is the channeling of a spirit where you allow them to use your body to draw symbols and write messages that you can later interpret. It’s a practice that you do in a trance-like state and it takes a lot of time and energy to learn how to empty your mind properly. But once you do, you can receive messages from the spirit realm. Some people can sense auras around other people. Their aura gives you the ability to see their immediate future as well as to get a sense of the health, stress level, mental state, as well as to sense things that are concerning them. Having your aura read is a great way to get at the root of issues that have been bothering you that you might be ignoring. Scrying, in general, involves looking into a shiny surface and interpreting what you see there. Many people think of crystal balls when they think of scrying, but you can also use unique bowls or mirrors. A scrying mirror is usually colored black and can create illusions in which readers can see different objects, people, and things happening. A scrying bowl is made of either metal, glass, or stone, and is filled to the brim with water when in use. It’s used in a meditative or trance-like state. Using divination tools can be a great way to get guidance on your most pressing questions in life. But if you’re not practiced in the art of divination, it can be difficult to do a reading on your own. Why not turn to an expert to help you get a clear message? Contact a psychic today.